This interview with Bonnie Marcus originally appeared in Forbes. Have you noticed? There has been a lot of buzz about introverts lately, and the more we learn about introverts, the more we understand the power of introverts to lead and influence others. There is no doubt that the workplace tends to be biased toward those who are more charismatic and outgoing. However, introverts can also be highly effective influencers when they lean back and use their natural strengths. Jennifer Kahnweiler, is an expert on the subject of introverts. Her book, Quiet Influence: The Introvert’s Guide to Making a Difference, helps us to understand the qualities that introverts possess, and how they can leverage these strengths to be successful. Bonnie Marcus: What’s the difference between being shy and being introverted? Jennifer Kahnweiler: Shy is typically associated with more psychological or social anxiety. So one can be shy and introverted, but they don’t necessarily go together. Introversion is really how you’re hardwired – it’s not good, it’s not bad, there’s no judgment there. It’s just a temperament. And so, people oftentimes mix them up. The main differentiator I share with people is based on what Carl Jung said many years ago, it’s where you get your energy. If you’re somebody who’s more in your head, if you’re really energized by what’s going on inside yourself than you are on the outside world, then you typically tend to be more introverted. An extrovert gets charged up and gets energized by other people, by being out, by stimuli outside of themselves. And it’s not either/or. You can have both. Marcus: What are the natural strengths introverts have that allow them to lean back and influence others? Kahnweiler: Influencers make a difference by challenging the status quo and by provoking new ways of thinking, effecting change, and inspiring others to move forward. 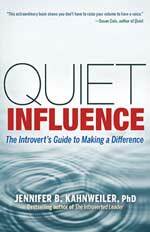 Quiet Influencers begin their influencing journey where they think and recharge best: in quiet. Quiet Time provides energy, increases self-awareness, and spurs creativity. Next comes Preparation. Through creating a strategy and asking questions, they become more comfortable and confident in their efforts to influence others. They may tap into their innate strength in Engaged Listening to build rapport and mutual understanding. Or they may choose Focused Conversations which are purposed driven dialogues in which they problem solve and work through conflicts with others. They may use their natural strength of Writing where they articulate authentic, well developed positions to make a difference with others. Finally, Quiet Influencers consider how Thoughtful Social Media Platforms can advance their cause. Marcus: Introverts are more apt to lean back and stimulate and inspire others. They hold back and let others take the stage. Does this make them better leaders? Kahnweiler: There has been quite a bit of very exciting research that was done by Adam Grant and Francesca Gino – both at Wharton and at Harvard – where they came out with a theory, or they proved a theory, pretty much, through a very large design, that introverted leaders really make the best leaders for what they were saying were more, outgoing or extroverted, employees or team members. And it was simply because they were “leaning back”. Have you ever been to a meeting where people are talking very vociferously about a topic, and there are a lot of individuals engaged. But then, there’s that one person, at the end of the conference table who chimes in, and just nails it. There’s been all this chatter – as one of the introverted leaders told me, he said, it’s like having all these cackling geese. And he says, he seems himself as the great blue heron that swoops in with the compilation, with the concise statement that really sums it all up. Marcus: Women introverts have extra challenges especially if they work in male dominated organizations or industries. They get cited on performance reviews for not speaking up and are told to “lean in” more if they want to get noticed. What are some tips for these introverted women who often remain invisible? Kahnweiler: When I work with women who are introverted, I help them learn basic tangible skills such as icebreaking skills and how to start a conversation. I have suggested women join with other women. These professional groups may be a local group with women across different fields from different organizations, or if you’re in a large organization, network with women throughout the organization. That’s one key way to start to practice these skills to gain confidence. Because that’s really the key; it’s not like you have to really be an expert small talk person. But you could practice a little here and start to believe in yourself more. That’s a big part of it as well, the lack of confidence. And then, the other strategy is to gain a mentor, somebody who can help you navigate some of those tricky interactions with men. The bias that organizations have toward the more charismatic outgoing personality is apparent. Women are coached to “lean in” more if they want to succeed. The message here for introverted women, however, is clear. You can “lean back” and use your natural strengths of keen observation and listening to assess the environment and people and make powerful meaningful one on one connections and conversations. It’s not always about being the loudest or the first to speak up. Leaning back is a great first step to leverage your natural strengths, influence others, and show leadership potential. This entry was posted in Uncategorized on October 30, 2016 by Jennifer Kahnweiler.